Fabulous North Slope apartment located on the 2nd floor of traditional Brownstone. Can be used as 2 br or large 1br plus study. 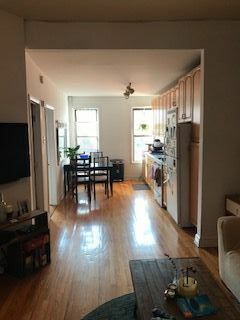 Features include large eat in kitchen,(no dishwasher) brand new stainless steel appliances just installed, stunning hardwood floors, exposed brick and Northern and Southern exposures, which flood the apartment with natural light all day long. French doors, large custom California closets and spacious bathroom. Located right on the border of Prospect Heights, you're 5 minutes from the Barclays Center, All major subways and you're 10 minutes by foot from the Brooklyn Museum, Botanic Gardens & Prospect Park. Drop off and pick up laundry service available one block away! Landlord request first, last and security at lease signing. Sorry, 2 person max, no pets.